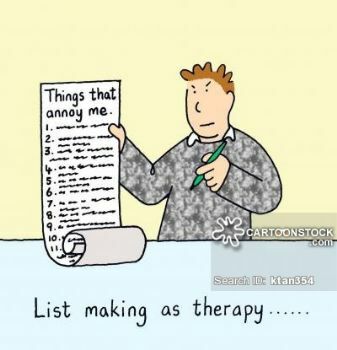 Trust me, you want to make the list as short as possible and omit the things that annoy you! (who has all day lol) .... Your list need not look like the Dead Sea scrolls that will take a lifetime to complete. They can be as short as three top priorities in your life and as little as ten minutes each day! ... Now doesn't that sound appealing! red flag. 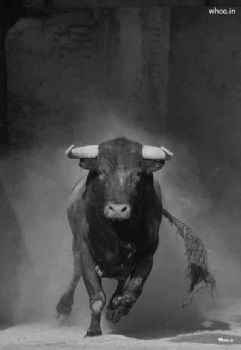 My focus is right there and it has my full attention! ...It can be as simple as 1-2-3! Whether it is ten minutes for exercise, or ten minutes to clear that extra room; anything that is important to you! 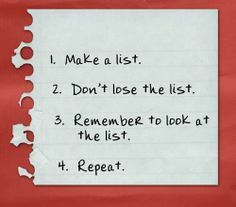 Here's the thing: I used to keep my list in my head until it got to be too crowded in there! It builds MOMENTUM!! ... When you see your accomplishment and move it over to your 'finished' list, you will feel not just good about yourself .... you are going to feel AWESOME AND AMAZING!! ...Plus, as you begin to conquer goals, you will find your lists getting shorter, but your days longer and more JOY time for you and me! And thanks for stopping by today! Stay sparked .....And have a great day! I am a list maker. A good feeling comes over me when I am able to cross things off that list. I am a firm believer in Lists. I make lists for just about everything! Thanks so much for sharing! Great Blog. I just love your blogs Jan! 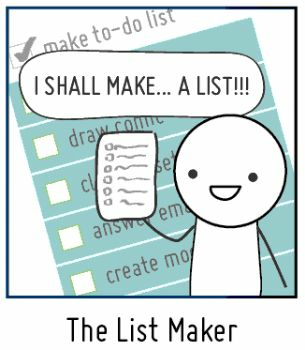 I am a total list maker. I think I make a list for everything! If I didn't make a list nothing would get done and I would forget everything I needed it at the grocery store! I've been keeping a list for years now. After my brain surgery I needed it just to get through the day. Now it just helps me so I don't forget what I want to do for the day. Great Blog! I too am a Big List Maker, keeps me on target. I'm a big "lister" ! I have to be or ill procrastinate or get distracted!! Great blog! Thanks! Having a plan (aka list) helps me to deal with stress. Thanks for the blog. This makes me feel listless. I love making lists! I try to cross off at least 7-10 things each day! Research shows there are positive feelings when we can cross something off a list. Done! I think I should start this right away, thanks! I have been a long list maker for many years and for recent years did not make that much list and now know for sure what is mentioned in the both the posts. Recently i again thought on making a long list of cleaning house, read on subjects and some got done in incremental manner and on it's own way naturally. I do read now daily that many people have lost so much weight in less time also. I praised them on their success as i know how hard it is do those and posted i want to first loose 10 pounds and then try for 15 pounds. My small list will include first to walk daily ( which i was doing easily as time was their , now some changes in the commute which i yet have to see and figure out a way if i can walk in the morning or join back in the yoga class if that is possible, something to figure out yet. Then drink 8 glass water ( 2 1/2 liter) as i see a pattern that eating more happens if drinking water is less. The protein bar i am eating more than one , so need to bring it down to 1. It should be 1-2-3. I am adding another my focus is that the health benefits it gives by doing these is important even if i do not loose weight. Try eating wholesome food and occasional junk. Love this! Thanks for the reminder...so simple and yet so effective! This is a great blog post, and I am with 11Snuggles11 -- BULLET JOURNAL!! For all who like to make list, manage lists, and show accomplishments, you all should look this up!! I started using the method in January and it's has helped me tremendously. BULLET JOURNALING -- check it out. I start my list with something that I've already done so I can check something off right away! I use lists as therapy. Loved reading this. I am making my list now! Have a great day! I actually just made my list for today! LOL It helps me get done what needs to get done and it also helps me remember what I did! I'm with ya on the list thing...it helps! Oh I’m definitely a list maker!! On my “eh, take the day off” nothing gets done. On the list days,,,, large majority (hmm should I use the word large on Sparks? Grin) I smile a lot!! In general I do my list on my phone with my notebook app, but I want something I can decorate. Think I’ll switch it over to my sketch app!! Lots of "brain science" backing you up on the list making. Very similar to goal setting, in a simple, daily way. Great practice, very affirming! Getting the list on paper rather than your head means you do not have to remember everything. Plus it is great to line through a completed task! I love lists, I'm using my phone more. I have always made lists--for homework to housework! Yep, it's easy and fun. Thanks again for a terrific blog! I chuckled when you said the list shouldn't be like the dead sea scrolls! Some people hate lists-I love to do them. My husband will not even look at the lists of to do stuff I make for him, even if it is short...it collects dust. HA! job...keep up the good work on your encouraging others on SP. Always like Sparkguys blogs too!